Historically, salt marshes have not only served as ecological nurseries for fish, birds, and other wildlife–they've been stalwart defenses against coastal storms. But recently, coastal development coupled with accelerated sea level rise has threatened wetlands across the globe. Among them are the salt marshes in New York City's Jamaica Bay, an 18,000-acre estuary bordered by Queens and Brooklyn. Using sediment cores to trace the evolution of Jamaica Bay's wetlands, a team led by researchers within Columbia's Earth Institute finds that urbanization is weakening the shoreline and starving the marshes of vital mineral sediment, causing their gradual but dramatic erosion. 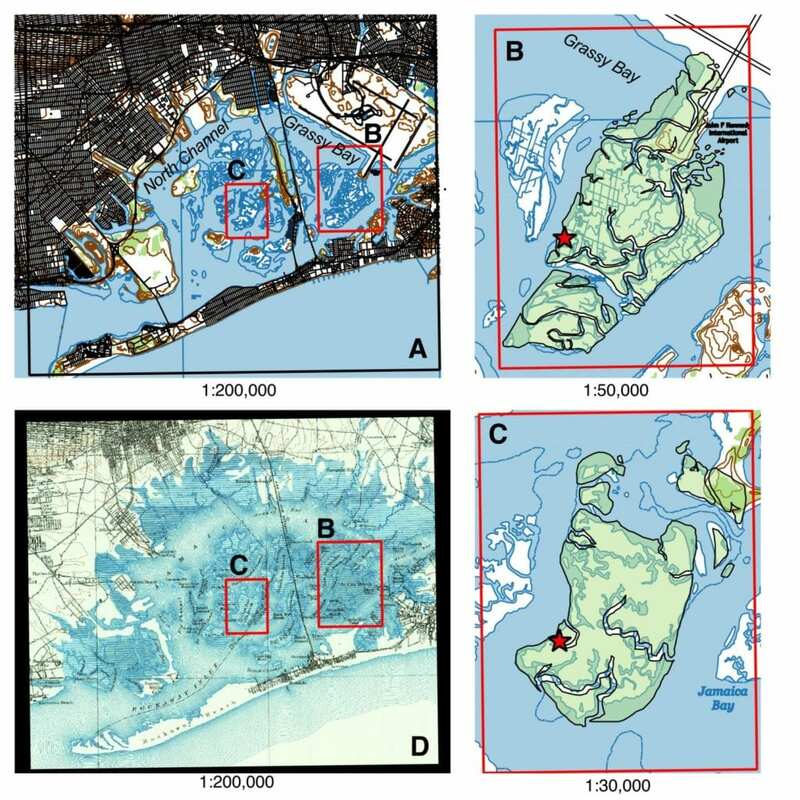 The study, published in Proceedings of the National Academy of Sciences, also offers strategies to restore and preserve these important natural systems in Jamaica Bay and elsewhere. "We knew that these marshes were disappearing, and there were lots of reasons people had proposed as to why," said Dorothy Peteet, lead author and senior research scientist at NASA/Goddard Institute for Space Studies and Columbia's Lamont-Doherty Earth Observatory, "but no one had actually looked at the organic and the inorganic part of it to see why the marshes are fragmenting." The Jamaica Bay wetlands have helped dampen waves and substantially block or slow down winds that accompany storms. The marshes have also been a haven for an estimated 325 species of migratory and resident birds and upwards of 90 types of fish. In recent decades, though, these marshes have been eroding at alarming rates–putting the shores and the animals at peril. Two sediment cores, which the team drilled from the marsh surfaces, provided a window into the area's past and revealed why the marshes are disappearing. A lack of inorganic sediment–or sand, silt, and clay–is depriving the marshes of mineral sediment that helps to hold the ecosystem together. Without these sediments, the marshes lose their structure and disintegrate. "The major cause of decline is that we have changed the natural sediment supply–we have destroyed the input for sand, silt, and clay," Peteet explained. Eighteen streams that once emptied into Jamaica Bay filled the estuary with rich amounts of sediment. Now only eight streams remain, and they bring "hardly anything but wastewater," said Peteet. "In the centers, the marshes have kept up because we still have the native grasses here–but at the edges, they're really not sustainable due to fragmentation." The Jamaica Bay wetlands are also being weakened by sea level rise–perhaps even more so than in other coastal regions of the U.S., since relative increases in sea levels due to climate change are greater in mid-Atlantic states such as New York. As such, regional sea levels are rising at faster rates than the marshes themselves–putting these mineral-depleted wetlands in danger of drowning. "Now, we're seeing almost five millimeters in sea level rise per year," said Peteet. "If your accretion rate is below that, there is no way the marshes can keep up." To restore and strengthen the salt marshes, the study recommends filling in Jamaica Bay's dredged areas and spraying sand, silt, and clay onto the remaining marshes. The estuary's craters must be filled in first, Peteet explained, so that the sprayed sediment doesn't leave the marshes and accumulate in the pits. Marshes were successfully restored in Los Angeles' Wax Bay Delta using these tactics. Collectively, upwards of $130 million has already been spent on tidal marsh restoration in Jamaica Bay over the past two decades, according to Adam Parris, executive director of the Science and Resilience Institute of Jamaica Bay. Government agencies such as the U.S. Army Corps of Engineers and the city's Parks Department are working to rebuild damaged marshes on the bay's islands and restore marshes that have been buried by fill. While these efforts are cause for hope, the rates and magnitude of sea-level rise anticipated for the next half-century remains concerning, Parris noted. "There is definitely no question that clean sediment will be required to help sustain those restoration projects over the long-term," he said. On a larger scale, manmade development has caused New York State to lose more than half of all its wetlands, and has resulted in the disappearance of marshes worldwide, said Peteet. "It is incumbent on us as people to remedy it."